We are also very excited to announce the addition of Santatranirina Razanakolona to our core team as part time Program Coordinator. Santatra has been invaluable to Madaworks from our beginning. He has helped coordinate efforts with PSI and PHE Madagascar Networks. Along with helping administer the scholarship program applications and translations, he also works as a liaison with the girls. 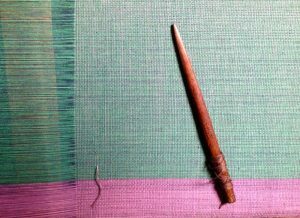 He has been helpful with Maeva and Famiova, the local women’s sustainable weaving cooperatives. These women’s weaving/basketry cooperatives are part of what Madaworks supports. We are increasing economic development for these women, ensuring a more steady income stream. At Centre ValBio, Santatra works as Administrative Liason. Santatra goes above and beyond what is required in that he is always thinking of ways to help improve opportunities for the women’s cooperatives and the girl’s of this region. Thank you Santatra for all you do! We started Madaworks in December 2015 supporting one girl, Julie Rakotozafy. This fall we will be supporting 10 girls. Five girls are currently enrolled in our program and we will add five new girls in September 2018. Our sincere thanks go to the US Embassy in Madagascar for supporting the education of more girls to go to high school. 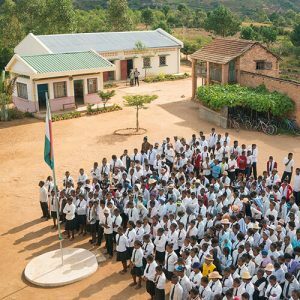 Our project supports one of the Mission’s priorities which are to advance accountability and human rights in Madagascar through the promotion of enhanced and educated civic participation, particularly of youth and women. A special thank you to the couple from California who were part of a National Geographic Tour, who witnessed our Awards Ceremony in September 2017. They were so moved by our work and our impact that they are generously supporting two girls starting this year. We are very pleased to be providing the opportunity for more girls to have access to a high school education. Thanks to all of our friends, supporters and families for a great year-end annual appeal. 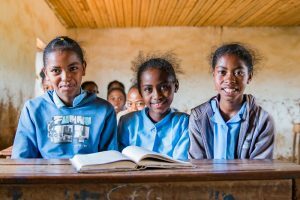 It is because of our supporters that Madaworks can create the scholarship opportunities for rural Malagasy girls. Our funds not only run the education program, but also allow us to purchase beautiful scarves and baskets from the women’s cooperatives. We use these items at local fundraisers in New York. 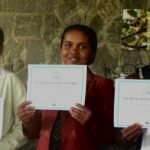 These fundraisers are an important way to spread the word about Madagascar and to help the economic development of these rural women. Stay tuned to our Facebook page for upcoming events. 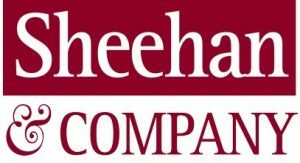 With the annual tax time season soon upon us, I would like to take a moment to thank our accountants from Sheehan & Co., John DeFalco and Rebecca Brodsky. John and Rebecca believe in our program and very generously donate in-kind services. These services help with taxes and accounting. Without this accounting help we would be at sea! Thank you again for your generous support. 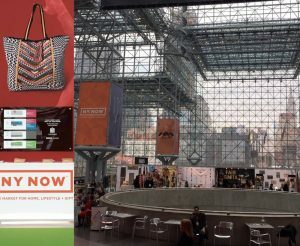 Madaworks had the opportunity to visit the incredible New York City trade show, NY NOW, as a guest of Mar Y Sol. This event is a showcase of an international spectrum of home goods, crafts, jewelry and accessories vendors. It is so important for Madaworks to gain marketing knowledge to help our women’s sustainable weaving collectives potentially break into the US market. This is a tall order since there were more than 2,300 brands from across the globe. Special thanks go out to Mar Y Sol for helping us learn more about the marketplace. 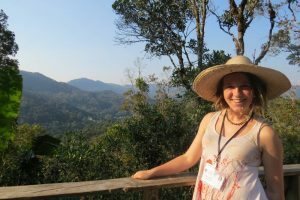 Madaworks has a new friend, Nina Finley, a Watson Scholar who visited Madagascar as part of her scholarship study. Nina is a remarkable young researcher, artist and writer. 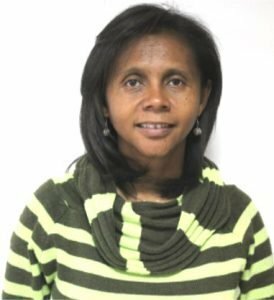 Having seen first hand the challenges Madagascar faces, she decided to do something to help. She saw what we were doing to help rural girls get educated and was inspired to raise enough money from friends and family to support two more girls. From 36 people she raised $3600! Her students will be the springboard for our 2019 program. Congratulations and thank you again Nina! 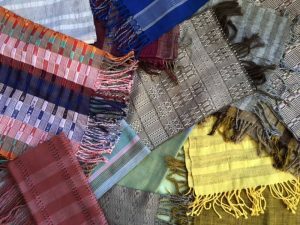 We are grateful to Katherine Kling, a graduate student of Dr. Pat Wright, who acted on our behalf to purchase beautiful scarves for our inventory. She recently returned from Madagascar for her research and brought back some amazing scarves for us. In this way we are able to continue to support the women’s weaving cooperatives, throughout the low tourist season. We sometimes ask researchers and professors to help us with this process, which in turn helps provide a continuum of income for the women. In part because of Madaworks support, we have helped increase the sales and production for these women. Thank you Katherine! Lastly, some food for thought as to why we do what we do. All that we do at Madaworks helps the most marginalized people in one of the poorest places on Earth. Thanks to all of you, we are making a difference!